To understand the brain and its devastating diseases, we need to reveal the mechanisms that produce it and the ways in which it can constantly change throughout a lifetime. This book features a timely and insightful discussion between developmental neurobiologists and clinicians who deal with disorders of the nervous system. 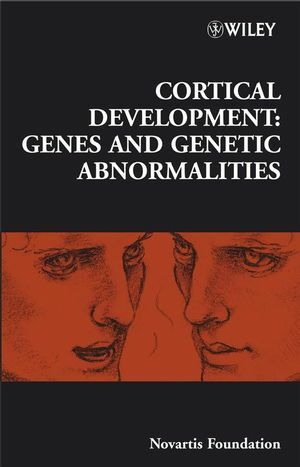 Chapters in this book deal specifically with cell fate determination, cell migration and disorders of cell migration; current concepts and new ideas about cortical arealisation, and disorders which can arise from incorrect arealisation; genes implicated in the development of cortical connectivity and related pathologies such as schizophrenia and synaesthesia; and susceptibility genes for cognitive disorders such as schizophrenia, autism, dyslexia, and attention deficit disorder. Chair: John Parnavelas, University College London, UK. Symposium on Cortical development: genes and genetic abnormalities, held at the Novartis Foundation, London, 6–8 February 2007. Editors: Gregory Bock (Organizer) and Jamie Goode. This symposium is based on a proposal made by Zoltán Molnár. John G. Parnavelas Chair’s introduction. Bradley J. Molyneaux, Paola Arlotta and Jeffrey D. Macklis/Molecular development of corticospinal motor neuron circuitry. Gordon Fishell /Perspectives on the developmental origins of cortical interneuron diversity. Pasko Rakic, Kazue Hashimoto-Torii and Matthew R. Sarkisian /Genetic determinants of neuronal migration in the cerebral cortex. Stephen C. Noctor, Veronica Martinez-Cerdeño and Arnold R. Kriegstein /Neural stem and progenitor cells in cortical development. Teresa H. Chae and Christopher A. Walsh /Genes that control the size of the cerebral cortex. Vicki Hammond, Joanne Britto, Eva So, Holly Cate and Seong-Seng Tan /Control of cortical neuron layering: lessons from mouse chimeras. Fujio Murakami, Daisuke Tanaka, Mitsutoshi Yanagida and Emi Yamazaki /Intracortical multidirectional migration of cortical interneurons. Libing Zhou, Fadel Tissir and André M. Goffinet /The atypical cadherin Celsr3 regulates the development of the axonal blueprint. Dennis D. M. O’Leary , Shen-Ju Chou, Tadashi Hamasaki, Setsuko Sahara, Akihide Takeuchi, Sandrine Thuret and Axel Leingärtner /Regulation of laminar and area patterning of mammalian neocortex and behavioural implications. Jeremy A. Cholfin and John L. R. Rubenstein /Genetic regulation of prefrontal cortex development and function. Henry Kennedy, Rodney Douglas, Kenneth Knoblauch and Colette Dehay /Self-organization and pattern formation in primate cortical networks. Nobuhiko Yamamoto, Takuro Maruyama, Naofumi Uesaka, Yasufumi Hayano, Makoto Takemoto and Akito Yamada /Molecular mechanisms of thalamocortical axon targeting. Zoltán Molnár, Anna Hoerder-Suabedissen, Wei Zhi Wang, Jamin DeProto, Kay Davies, Sheena Lee, Erin C. Jacobs, Anthony T. Campagnoni, Ole Paulsen, Maria Carmen Piñon and Amanda F. P. Cheung /Genes involved in the formation of the earliest cortical circuits. Michael Piper, Amber-Lee S. Dawson, Charlotta Lindwall, Guy Barry, Céline Plachez and Linda J. Richards /Emx and Nfi genes regulate cortical development and axon guidance in the telencephalon. Paul J. Harrison /Schizophrenia susceptibility genes and their neurodevelopmental implications: focus on neuregulin. Peter B. Crino /Focal brain malformations: a spectrum of disorders along the mTOR cascade.